Market research is an activity to gather user/consumer insights to help create, develop, and or improve new product/services. What type of market research do you conduct? Every possible type: online surveys, group discussions, individual interviews, workshops, telephone interviews etc. How long are the events or studies? There is no general answer to this question. Our studies normally last between one and two hours, but it could be longer or shorter than this. in central locations in city centers. 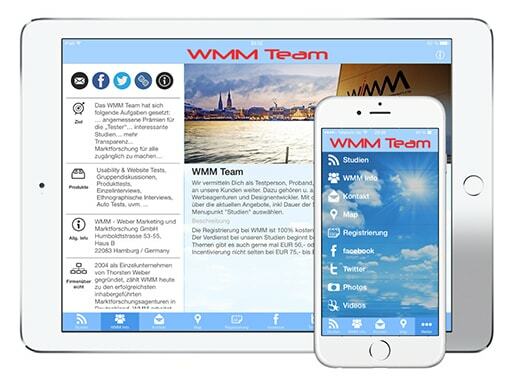 On our B2B page “WMM Studio” (www.wmm-studio.de) you can see a variety of the studios that we use. How much can you earn for taking part in market research studies? The amount varies. On average, you will receive approximately €20 for each hour of time spent, but you could receive more than this. Do I have to buy or pay for anything during the events? No. Our events are solely for market research purposes and not for promotional purposes. Is there any obligation for me to participate in a particular study? No. Neither party is under any obligation. Registration is free and non-binding. How often will I receive a referral? And how often can I participate in your studies? This varies, as it depends on a lot of different factors. We have to strictly adhere to our clients’ requirements, which are sometimes very specific. How will you contact me and how will I receive invitations to participate in studies? We will contact you either by e-mail or by telephone. I meet all of the criteria that you are looking for. Why am I sometimes not selected to participate in a particular study? There are several reasons for this. We try to assign our studies to our registered participants in a fair manner. We also have to adhere to our client’s requirements, and some of the requirements are not always obvious. This means that sometimes your profile is not a 100% match with our requirements. Does it cost anything to register with WWM? No. Registration is free! You will not incur any costs! Why can’t I log into the member’s area, despite having received my membership details? We need to “activate” your registration before you are able to log in, and this normally takes one to three business days. If you change your registration information at any point, we will again have to activate your new details. Once again, this normally takes no more than one to three business days. Why do you need the information on the registration form? This information is required in order to divide participants into the respective groups and studies, and in order to assess participants’ qualifications. Our clients have an exact idea of “their” respondents. Therefore, your information will improve your chances of being referred. Do you also forward the information and details I have provided to other companies? No. Your information is subject to the Data Protection Act and will be treated very sensitively. Only information related to your employability will be shared. Do you also call strangers at home? No, we do not. We only contact people who also enjoy participating in our studies and who are registered with us. Do you also send out advertising, or will I receive advertising from you by providing my email address and/or my postal address? No. We only send out e-mails in order to inform you about our activities. We do however make an effort to share price savings with you from time to time, or to inform you about special offers. In addition, it may also be the case that we introduce you to a new business partner. Once again, this normally only happens in connection with an informational email. We will not share your address information with third parties.